Eileen of Avoca didn’t really come back to Saint Laurent this time. I left her on the hard at Power Boats in Chaguaramas to do a little advertising, as I planned to travel a little more quickly over the next few months. Who wants to come and play? 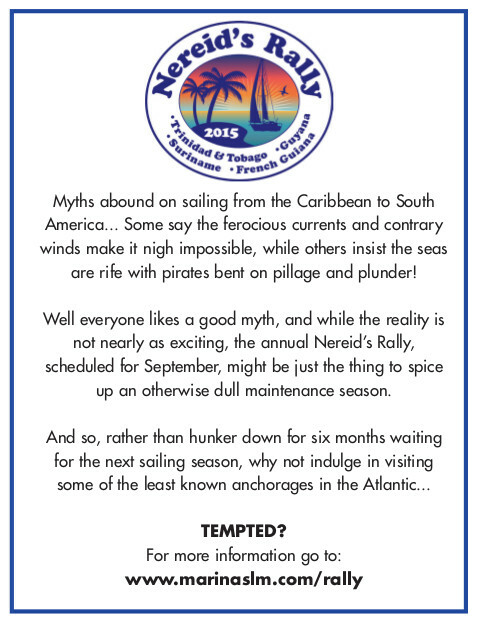 And just to make sure the rally message was getting through, I decided to run an ad campaign on Caribbean Compass…. The editors had been nice enough to run a few articles and news posts on sailing down this way in the past, so a little business sent their way was certainly overdue. But would anyone really pay attention? 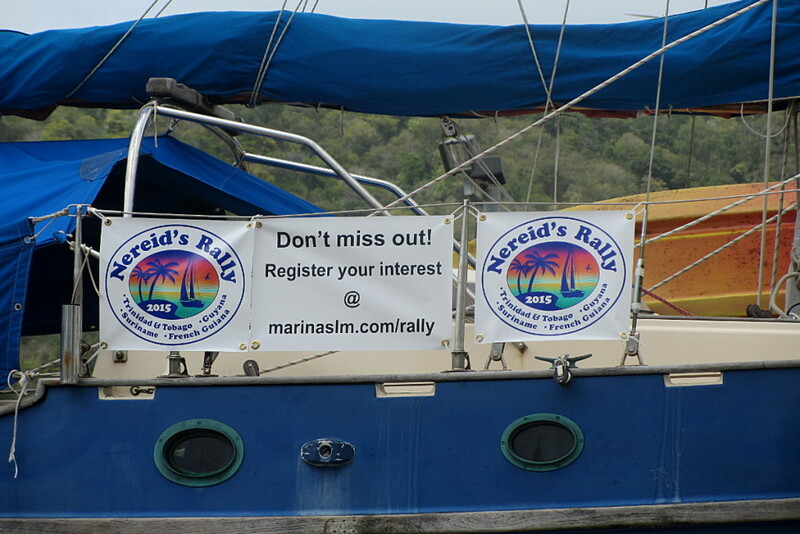 The Nereid’s Rally is an annual yachting event open to the cruising community, competitive sailors or anyone else wishing to make the most of the Caribbean hurricane season. It is the only international yacht rally for Trinidad & Tobago, Guyana, Suriname and French Guiana. Held every September, it runs for a little over a month, bringing together a varied group of cruising yachtsmen and women keen to experience the cultural diversity, natural beauty and unique flavour of the region. Often billed as the rally for people who aren’t really “rally people”, the event has always been more about visiting the destinations than just sailing. The Nereid’s Rally is not a race, nor is it a flotilla. Yachts are encouraged to set their own pace and simply meet up for the official welcome ceremonies and social or cultural events. Everything kicks off with a formal seminar in Chaguaramas Trinidad on the 16th of August where delegations from Guyana and French Guiana together with rally representatives, showcase their attractions to potential visitors and rally participants. Though crews preparing their yachts often arrive several weeks in advance to carry out routine maintenance. Shortly after Trinidad’s premiere motor boat event, “The Great Race” and independence day celebrations, a send-off party marks the beginning of the rally proper, and gives participants one last chance to “lime” with the locals in either Trinidad or Tobago (there are two starts), before setting sail on either the 2nd or 3rd of September. This year we plan to present some Trinidad & Tobago talent to make the 2015 departure the most memorable to date. An official welcome hosted by the Minister for Tourism awaits participants on the 11th of September at Hurakabra Resort Guyana. Crews will then be given the opportunity to visit indigenous communities, explore some of the natural wonders of the region or go sight-seeing in the capital. On the 18th of September the rally sets off again for the Maroni river on the border of Suriname and French Guiana where locals from both sides of the river (Galibi and Awala-Yalimapo) will play host to the international navigators before their final welcome in Saint Laurent du Maroni on the 3rd of October, which marks the end of the rally. This entry was posted in French Guiana and tagged ads, Nereid's Rally, press release, publicity campaign by admin. Bookmark the permalink.